Three of the cruise industry’s best bartenders will compete for the title of Diageo World Class World Bartender of the Year. Norwegian Cruise Lines’ Razvan Dorel Cordea from Romania, Seabourn Cruise Lines’ River Wood from South Africa and Celebrity Cruises’ Igor Ilioski from Macedonia, move on from the Global Travel semi-finals of the competition which took place in Miami on June 28, to compete in the prestigious World Class Final in Berlin in October. 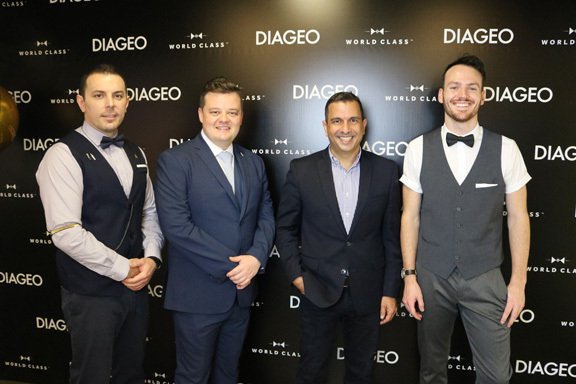 The three finalist cruise bartenders who competed in Miami on June 28 for the Diageo World Class title, with Diageo GT Commercial Director Marcos Bibas (third from left). The winners will battle it out against over 50 of the world’s best bartenders on October 5-8 2018 in Berlin for the coveted ‘Diageo World Class Bartender of the Year’ title. The semi-finalists participated in two challenges which showcased their craft, creativity, knowledge, technique, presentation and the overall delivered drinking experience. The ‘Market Basket Challenge’ gave them the chance to create two of their own cocktails using fresh ingredients they bought during a 45-minute visit to a local farmers’ market, while the ‘Cocktail Against the Clock’ challenge was all about demonstrating the speed and skill of making 4-6 cocktails of their own choosing in a 5-minute period. The judging panel was made up of industry experts including Andrew Meltzer; Diageo World Class U.S. Bartender of the Year 2016, Ben Potts; one of Top 10 Bartenders in Miami as voted by Miami New Times, and Eric Ribeiro; Beverage Consultant at Parisian Shaker. Marcos Bibas, Commercial Director Diageo Global Travel said: “We are delighted to support a program which educates and inspires bartenders to deliver out-standing drinks experiences, and we believe this is particularly important for cruise line bartenders on board our partners’ ships who consistently deliver exceptional drinks experiences for their guests.